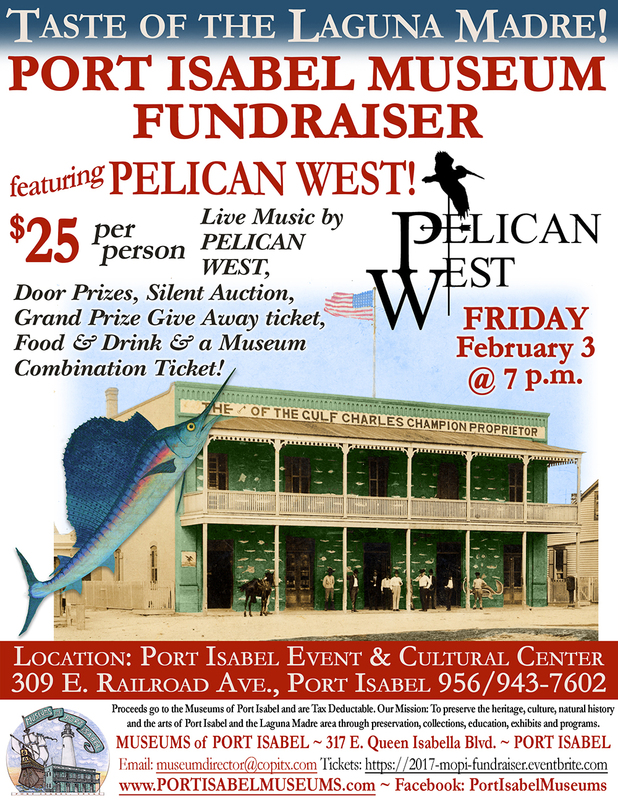 The Museums of Port Isabel are proud to announce its 22nd Annual ‘TASTE of the LAGUNA MADRE’ Museum Fundraiser featuring fresh local fare & PELICAN WEST! The Museums of Port Isabel will host this culinary event on Friday, February 1, 2019 from 7 to 10 p.m. at the Port Isabel Event & Cultural Center. Dishes prepared by local restaurants will be top of the fare and includes side dishes, desserts and beverages. Live music by PELICAN WEST, door prizes, a silent auction and a Port Isabel Adventure Package raffle are all part of the $25 ticket price. The Museums of Port Isabel is a complex consisting of three diverse facilities, the Port Isabel Historic Museum, the Treasures of the Gulf Museum, and the Point Isabel Lighthouse. All three are within walking distance of each other and are open year around to the public. Constructed in 1852, the Point Isabel Lighthouse was built to protect and guide ships through Brazos Santiago Pass and the barrier islands. In 1952, the Lighthouse was opened as a State Park and remains the only lighthouse on the Texas Gulf coast open to the public. The Lighthouse has just undergone a Texas Parks & WildlifeDepartment restoration and reopened to the public on January 2, 2018. The Lighthouse Keeper’s Cottage which is on the grounds of the Lighthouse, is open to the public and houses the Chamber of Commerce and the Port Isabel Visitors Center. There is no admission charge to the Keepers Cottage. Lighthouse tickets can be purchased at the Keepers Cottage or at the Lighthouse. A combination ticket is available. Last ticket sold at 4:30 p.m. or 1/2 hour before closing. Port Isabel Historical Museum is a state-of-the-art facility located in the Champion Building. Built in 1899 as a dry goods store and residence, it now houses two exhibit levels, a theater, gift shop and one of the largest collections of Mexican artifacts from the U.S.-Mexican War. The facade features the famous ‘fish mural’ painted in 1906 by a local fisherman. The fish mural was restored in the fall of 2017. Last ticket sold at 3:30 p.m. 317 E. Railroad Ave., Port Isabel. 956/943-7602. Treasures of the Gulf Museum spotlights three 1554 Spanish shipwrecks. Meeting their fate just 30 miles north of Port Isabel, they are brought to life with murals, artifacts and hands-on activities. Also featured is a Children’s Discovery Lab, Ship theatre and Nautical Gift Shop. Last ticket sold at 3:30 p.m. 317 E. Railroad Ave., Port Isabel. 956/943-7602. THANKS TO OUR ALL OUR DONORS! The Museums of Port Isabel are proud to announce its 21st Annual ‘TASTE of the LAGUNA MADRE’ Museum Fundraiser featuring fresh local fare & PELICAN WEST! The Museums of Port Isabel will host this culinary event on Friday, February 2, 2018, from 7 to 10 p.m. at the Port Isabel Event & Cultural Center. Dishes prepared by local restaurants will be top of the fare and includes side dishes, desserts and beverages. Live music by PELICAN WEST, door prizes, a silent auction and a Port Isabel Adventure Package raffle are all part of the $25 ticket price. Constructed in 1852, the Point Isabel Lighthouse was built to protect and guide ships through Brazos Santiago Pass and the barrier islands. In 1952, the Lighthouse was opened as a State Park and remains the only lighthouse on the Texas Gulf coast open to the public. The Lighthouse has just undergone a Texas Parks & Wildlife Department restoration and reopened to the public on January 2, 2018. The Lighthouse Keeper’s Cottage which is on the grounds of the Lighthouse, is open to the public and houses the Chamber of Commerce and the Port Isabel Visitors Center. There is no admission charge to the Keepers Cottage. Lighthouse tickets can be purchased at the Keepers Cottage or at the Lighthouse. A combination ticket is available. Last ticket sold at 4:30 p.m. or 1/2 hour before closing. The Museums of Port Isabel are proud to announce its 20th Annual ‘TASTE of the LAGUNA MADRE’ Museum Fundraiser featuring fresh local fare & PELICAN WEST! The Museums of Port Isabel will host this culinary event on Friday, February 3, 2017, from 7 to 10 p.m. at the Port Isabel Event &amp; Cultural Center. Dishes prepared by local restaurants will be top of the fare and includes side dishes, desserts and beverages. Live music by PELICAN WEST, door prizes, a silent auction and a Port Isabel Adventure Package raffle are all part of the $25 ticket price. 19th Annual Taste of the Laguna Madre! This is THE Museums of Port Isabel FUNDRAISER! Scheduled for Friday, February 12th, from 7 to 10 p.m., at the Port Isabel Event & Cultural Center, the fundraiser proudly presents live music with PELICAN WEST! Tickets are on sale now at the Port Isabel Visitors Center, Museums of Port Isabel, Port Isabel Chamber of Commerce, Port Isabel Public Library and online at https://2016-mopi-fundraiser.eventbrite.com. For more information call Jeannie Flores or the Museum Staff at 956/943-7602. Thanks to our SPONSORS & DONORS! The Museums of Port Isabel are proud to announce its 18th Annual ‘TASTE of the LAGUNA MADRE’ Museum Fundraiser featuring SHRIMP & FISH & FARE & PELICAN WEST! The Museums of Port Isabel will host this culinary event on Friday, February 13, 2015, from 7 to 10 p.m. at the Port Isabel Event & Cultural Center. Seafood, prepared by local restaurants will be top of the fare and includes side dishes, desserts and beverages. Live music by PELICAN WEST, door prizes, a silent auction and a Port Isabel Adventure Package raffle are all part of the $25 ticket price. This IS the Museums of Port Isabel’s major fundraiser. Donations will be used to upgrade Museum’s exhibits and support programs. Info: 956/943-7602 or museumdirector@copitx.com. Tickets can be purchased at the door, Port Isabel City Hall, Port Isabel Public Library, Port Isabel Chamber of Commerce, South Padre Island Chamber of Commerce or at the Museums of Port Isabel. Facebook event: http://on.fb.me/1FXNqc4. Thanks to our sponsors! PADRE ELITE TEAM, TEXAS INTERNATIONAL FISHING TOURNAMENT, PORT ISABEL – SAN BENITO NAVIGATION DISTRICT, 1st NATIONAL BANK of SOUTH PADRE ISLAND ~ QUIK STOP! Thanks to our SILENT AUCTION donors! 9/14 DUE TO INCLEMENT WEATHER THE LIGHTHOUSE IS CLOSED. CHECK BACK FOR UPDATES. The Museums of Port Isabel is a Department of the City of Port Isabel. Our Mission: To preserve the heritage, culture, natural history & the arts of Port Isabel and the Laguna Madre area through preservation, collections, education, exhibits & programs.